Waiting for Cochin Shipyard Recruitment 2019? If yes then you can apply from here. Cochin Shipyard Limited is inviting the candidates to apply for 40 Project Officer Posts. Interested & Eligible candidates can fill online application for Cochin Shipyard Project Officer Recruitment 2019 from the direct link as given below. Commencement of the online registration process will be 30.03.2019 for Project Officers. You can fill up the application form till the 24.04.2019 for Cochin Shipyard Jobs 2019. Candidates who belong to general category have to Rs 200/- and SC/ST application fees is exempted. You can collect more information about the Cochin Shipyard Limited Vacancy 2019 from the given below article. What Are Simple Steps To Apply For Cochin Shipyard Sr. Project Officer Jobs 2019? How to Apply Form For Cochin Shipyard Recruitment 2017 For Various Vacancy ? What is Eligibility Criteria For Cochin Shipyard Recruitment 2017 – 18 For CSI 172 Post ? How to Apply Cochin Shipyard Apprentice Online Application Form through Cochin Shipyard Recruitment ? What is the Minimum Education Qualification & Age Limit for Cochin Shipyard Recruitment 2017 – 18 ? How Much Age Limit Required For Cochin Shipyard Recruitment 2017 – 18 ? What is the Application fee for Applying Cochin Shipyard limited Jobs Online Form ? Get Cochin Shipyard Recruitment Notification Pdf. Click on it. Read out the Cochin Shipyard Project Officer Vacancy. Start up filling up the application form with correct details. Upload the colored passport size & signature in the form. You need to pay the application fees..
Recheck the whole application form once again. Take out the print of it on the plane paper. Conclusion: Cochin Shipyard Recruitment 2019 online form is available here for 40 Project Officer Posts. 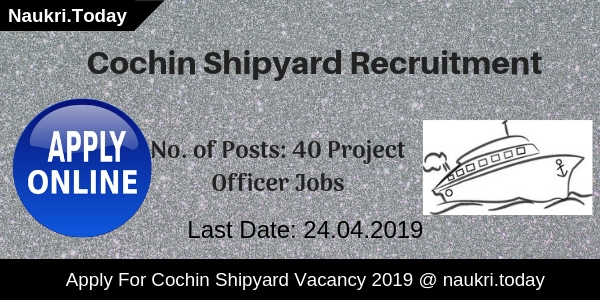 Applicants can apply for Cochin Shipyard Project Officer Jobs before the due date which is 24.04.2019 from here. Dear Applicants, Cochin Shipyard Limited has issued recruitment notification of 30 Fireman & Safety Assistant Vacancies. Participant who are interested in Cochin Shipyard Recruitment 2017 can fill online form for 30 Various Vacancy. Registration through Online mode has been started from 13.09.2017 & closing date of submit Cochin Shipyard Vacancy online form is 24.09.2017. Cochin Shipyard Limited is also called as CSL. Department has recently issued notification for recruiting candidates on Various Vacancies. This is a great job opportunity for all the candidates who are waiting for Cochin Shipyard Vacancy 2017. More information related to Education Qualification, Age Criteria & Other details you can get from below article. Which candidates are going to apply for Cochin Shipyard Recruitment 2017 for Fireman and Safety Assistant Jobs, they should check their eligibility criteria & Other Details from here. In the below section we are providing full information which is required for filling Cochin Shipyard Vacancy Online form. Candidate Should not more then 30 years as on 24.09.2017 for CSL Fireman Recruitment 2017. Age relaxation for SC/ST category is applicable up to 05 years & 03 years for OBC (Non-Creamy Layer) and 5 years for J&K domicile during the period 01.01.1980 to 31.12.1989. Those applicants who are interested for Cochin Shipyard Vacancy 2017 should be done SSLC qualification. For post wise details can check official notification, Which are given below. For Fireman Vacancy : Candidates must have passed Pass in SSLC & Having Minimum four to six months training in Fire Fighting from a State Fire Force or Public Sector Undertaking or a Government recognized course from a reputed institute/ Certificate in Nuclear Biological Chemical Defence and Damage Control (NBCD), including fire fighting on-board ships from Armed Forces/Recognized Institutions. Safety Assistant Vacancy : Pass in SSLC & Having One Year Diploma/Certificate in Industrial Safety from a government recognized institute of Public Sector Undertaking. Candidates need to pay Rs,. 100/- as application fee for applying online form for Cochin Shipyard Limited Vacancy. Fees must be deposited through online mode only. More information about Application Fee you can check from official notification. Applicants who get selected for Cochin Shipyard Fireman Vacancy will paid Rs. 17,400/- per month & For Safety Assistant Vacancy, selected candidates will Pay Rs. 18,400/- per month. Selection of the candidates for Cochin Shipyard Limited Recruitment will made on the basis of Practical Test & Physical Fitness Test. Candidates you can get full information about Cochin Shipyard Vacancy from official notification from here. Keep stay with this page fro more updates. Fill online application form care fully. Upload your recent passport size photo & required documents in online form. Send this print out form Before on 30.09.2017 at following address. Conclusion : Cochin Shipyard Recruitment 2017 for 30 Various Posts. Apply online form for CSL Recruitment 2017 from here before the last date, that is 24.09.2017. Cochin Shipyard Limited department has released a notification for 172 Apprentices vacancy. It is great opportunity for all the candidate who are waiting for Cochin Shipyard Recruitment 2017 – 18. Eligible applicants can fill the Cochin Shipyard vacancy form through online mode. After check eligibility criteria contestant can apply for Cochin Shipyard online form before the last date 31.08.2017. Cochin Shipyard Limited (CSL), premier Mini Ratna Company of Govt. of India, invites Online application from eligible Graduate/Diploma holders in Engineering and Diploma holders in Commercial Practice, for undergoing one year Apprenticeship training under the Apprenticeship (Amendment) Act 1973. We are providing here full details for Cochin Shipyard Recruitment 2017 – 18 notification. Name of Post : Graduate Apprentices & Technician (Diploma) Apprentice vacancy. We are providing here full details regarding Education Qualification, Age Limit, Application Fee and Selection Process of Cochin Shipyard Ltd Jobs. you can check notification of Cochin Shipyard Recruitment 2017. Notification link is available below. Candidate should have done degree in engineering, Diploma in relevant field from recognized university of education. For more details check official notification or given below image. Applicants who are fill the Jobs in Kochi Shipyard can check the maximum age limit & minimum age limit form notification. Upper, lower & relaxation age limit will followed as per Apprenticeship Rules. Contestant who are selected through Cochin Shipyard Recruitment can get good salary. Applicants who are posted in Graduate Apprentices post will paid a Rs. 8000/- Stipend per month. And For Category – II Technician (Diploma) Apprentices will get salary Rs. 7000/- Stipend per month. Applicants who are fill the form should be selected on the required documents. Shortlisted applicants will done on the basis of marks % in basic prescribed qualification. More details candidate can check official notification. At first, you should log on Official website www.exampolice.rajasthan.gov.in. Now click on notification of “Cochin Shipyard Apprentice Notification”. Read Cochin Shipyard Apprentice Recruitment notification carefully. If you are eligible then you should click on “Apply Online” link. After it, recheck all details before submission. Now make the payment of application fee if required. Take the print out of Cochin Shipyard Jobs application for future use. Conclusion Cochin Shipyard Recruitment 2017 : Cochin Shipyard Limited, Kochi has announced a notification for 172 Graduate & Diploma Apprentices vacancy. Interested & eligible candidate can fill the online application form before the last date 31st August 2017. Great News for all the applicants who are searching Jobs in Kerala State. Cochin Shipyard Limited, Kochi is inviting Online Application Form for recruiting Candidates on 198 Welder, Sheet Metal Worker, Fitter & Other workmen Jobs. Applicants who are interested in Cochin Shipyard Recruitment 2017 – 18 can fill application form through online mode. Online registration for Workmen Jobs has been started from 19th July 2017. . Last date for Submitting the Online form for Cochin Shipyard Welder Bharti 2017 is 30th July 2017. Participants who want to check more information Cochin CSL Workmen Jobs Notification, Eligibility Criteria and other, then candidates should read the given article properly. Candidates who are going to fill online form for Cochin Shipyard Vacancy 2017 must have passed SSLC with ITI Course in respective trade from any recognized Institute. Applicants should have minimum 03 years of post qualification experience or Training in a Shipyard or Heavy Engineering Company. More information you can check from official Notification. Applicant age of the candidates for Cochin CSL Jobs should be not more than 30 years as on 30.07.2017. Age relaxation will provided up to 05 year and 03 year respectively if they belongs to the SC/ST and OBC category. The candidates of other categories need to check the age limit from the Cochin Shipyard Jobs Advertisement 2017. Participants who Belong form General & OBC category need to pay Rs 100/- as application fee though online payment options (Debit/ Credit/ Internet Banking) for CSL Cochin workmen Jobs. Other category candidates like SC/ST/PWD category are exempted from paying application fee. Candidates will selected for Cochin Shipyard Limited Vacancy on the basis of Practical Test. Schedule & Venue of practical Test will notify later. Candidates keep stay with thia pge for for more updates about Examination & other for Cochin Shipyard Workmen Recruitment 2017. Then Go to the Career Page. Fill the all Required Details carefully without Any Mistake. After fill All detail, Recheck all detail before submission. Now Deposit application fee through online mode. Conclusion : Cochin Shipyard Recruitment 2017 – 18 for 198 Welder, Electrician & Other Post. Closing date for applying online form is 30.07.2017 & Last date for submit hard copy of application for Chins Shipyard Workmen Jobs is 07.08.2017.